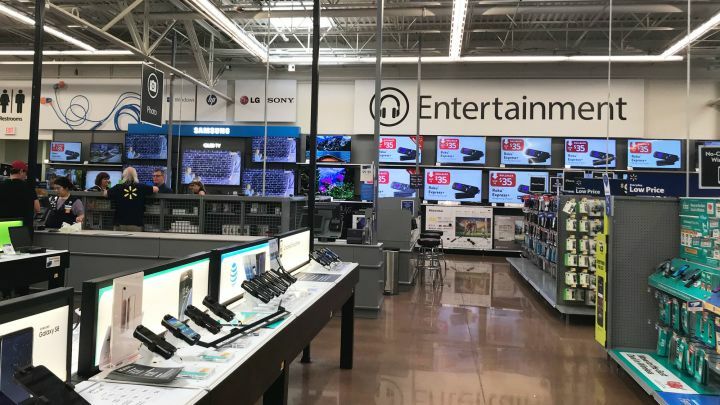 Walmart is been expanding the tech department in many of their retail stores and expanding the floorplan to put a bigger emphasis on laptops and its massive wall of flat-screen TVs. The company is also more focused on bringing in top-selling brands at an affordable price, like Lenovo. Walmart sources have disclosed to Good e-Reader that in the first two weeks of August Kobo e-readers will be available, in addition to other new tech products. Walmart plans on selling audiobooks and ebooks on their website and has been totally redesigning their online shopping experience. The changes will be all encompassing and include a visual makeover, the introduction of new personalization elements, as well as dedicated sections for specially shopping experiences. The Home and Fashion sections launched earlier this year, but the new site is not up yet, but will be soon. It remains to be seen if they can make money on a declining product category: last year, Americans bought about 490 million e-books, or roughly 17% of the book market. Digital books as a percentage of total sales peaked at about 23% five years ago and have since slipped. Walmart’s U.S. online sales rose 50% in its most recent full quarter, so there is an obvious market for online shopping. Currently there are no mainstream e-readers in Walmart stores, they booted the Kindle out years ago and are making most of their money with tablets, such as the iPad. The Kobo brand will play a small, but meaningful role for Walmart stores. The company will be able to make money selling the hardware and get a cut of every ebook purchased on a users device. They will also be able to generate additional revenue whenever a user purchases an audiobook on their website or via the new co-branded e-reading app for Android and iOS. Ask Amazon how effective Wally World’s on-line sales effort has been or likely ever will be. As far as in-store sales? Even if customers COULD find those devices mixed among snow tires & chain saws, Walmart shoppers ain’t exactly what you’d call friends of the written word. Meanwhile, Kobo continues to be available with a 20% exchange-rate discount for US customers at Chapters/Indigo’s website. Delivered door-to-door in 5 business days has been my experience. Kobo has astoundingly great product engineering and abysmally-awful marketing; even worse than Barnes & Noble. Walmart is absolutely the wrong venue for their products. LOL. I’ve been dying to make a comment about the “typical” Wally World shopper. I can just see it now. Hey Ma, how do you change the channel on this Kobo? Can this do fruit ninja? I have never been to a Walmart before, but Kobo e-readers have been available in Walmart Canada for years. Really. I prefer Target but I have a pretty good local Walmart. I buy my Parrot food there more that 50% cheaper than the petstore. Got three big bags of jumbo shrimp raw and cooked for like $5.50 a bag. You started fights at a Walmart? Any word on Walmart selling Kobo gift cards? Any word if Walmart will sell Kobo gift cards? I wonder about the language in this article… it seems to indicate that in addition to Kobo finding a new retail outlet with brick and mortar stores that can put devices in people’s hands, and give them a WHOLE lot more exposure (good for Kobo & Walmart, bad for Amazon, a competitor to both)… Kobo will also be creating a custom firmware or unique device ID that rewards Walmart with a piece of every ebook sale made on these devices? The Kobo eReaders rely on Rakuten ebook store, so I can’t imagine that Walmart will have an ebook store that integrates with these Kobo devices. On the other hand, how will Kobo differentiate a regular Clara HD from a Walmart Clara HD when it comes time to update firmware? Will there be separate firmwares? How will the Walmart devices carry over some unique ID to give credit to Walmart for ebooks purchased with the device? Correct. Instead you’ll pay $10 in taxes. ? I rather give a local indie store a cut and not Walmart. Do you know if we buy kobo at walmart do we have to shop threw walmart or can we sign up with kobo threw a local indie store so the can get credit? The author SHOULD know better than the ‘ebook sales have drop’ stuff. This is only true of the major Trade publishers who regularly and seriously over-price ebooks in order to support print sales. Amazon more than makes it up with independent authors and publishers where ebook sales are climbing, not dropping. And you can bet that Walmart, no doubt the world’s savviest marketer, would not be going into this market otherwise. You’ll have to find an indie bookstore that sells digital content first. They do not exist.